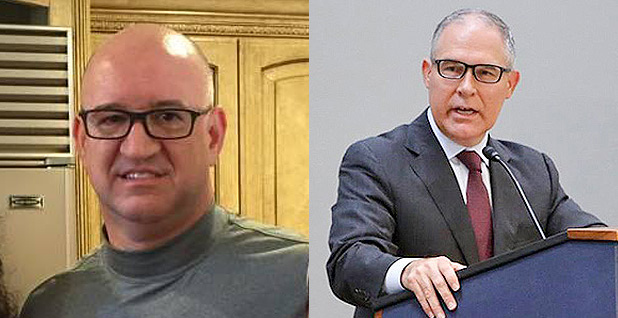 Attorney Kenneth Wagner (left) has been hired by U.S. EPA Administrator Scott Pruitt (right) as a senior adviser. Photos courtesy Wagner and Pruitt via Facebook. A longtime colleague from U.S. EPA Administrator Scott Pruitt's baseball and legal career is now a top official at the agency. Kenneth Wagner joined EPA last month as a senior adviser for regional and state affairs. Pruitt has sought to put his mark on EPA's leadership ranks since his Senate confirmation in February, with Wagner just the latest agency hire from the EPA chief's home state of Oklahoma. "Ken is understood inside the agency as a longtime adviser and friend to Administrator Pruitt who knows how he thinks about these issues and can put his ideas in motion," an EPA official told E&E News. "It's part of [Pruitt's] effort to have someone who has his back and understanding of his approach to these issues." The two have a relationship that stretches years and took shape in Oklahoma. Pruitt worked at the same Oklahoma law firm, Latham, Wagner, Steele & Lehman, where Wagner was a partner. Pruitt was affiliated with the firm in an "of counsel" capacity for several years. They also share an alma mater, the University of Tulsa College of Law, where they both graduated in 1993. The two partnered together when it came to sports, as well. In 2003, The Oklahoman reported that Wagner was a member of Pruitt's ownership group that took over the Oklahoma City RedHawks, a minor league baseball team. Pruitt was a co-owner and managing general partner of that team. In addition, Wagner has had political ties to Pruitt. He was treasurer of Pruitt's Oklahoma Strong Leadership political action committee, according to Federal Election Commission records. Pruitt shut down that group as well as his super PAC, Liberty 2.0, after facing questions over whether he planned to keep those political entities active while he ran EPA, which could have led him to raise funds from industries that he would regulate as agency head (Climatewire, Jan. 19). Wagner joins other former Pruitt political aides from Oklahoma who have come to EPA (Greenwire, March 20). Other associates of the EPA chief have joined K Street, registering as federal lobbyists for the first time last month (Greenwire, March 10). Pruitt kept up his ties to Latham, Wagner, Steele & Lehman when he was Oklahoma's attorney general. Wagner's firm had a contract with the attorney general's office before Pruitt took office, but its contracts continued with Pruitt as attorney general and grew in size, according to state records. The records show the firm has been paid at least $300,000 for its legal work for the attorney general's office. The firm had a contract for $35,000 for work on the state's Multiple Injury Trust Fund as Pruitt took office. That grew to $50,000 by 2011 in Pruitt's first year as Oklahoma attorney general. In 2015, the last year for which records are available, the contract was for $115,000, though the firm was actually paid more that year at about $165,000. According to the state's website, the Multiple Injury Trust Fund "protects employers from liability for the combination of old and new disabilities." The Oklahoma attorney general office's records of outside law firms are vague on some accounts. For some years, they list only the maximum contract amount, rather than the specific amount paid under the contract as well. The state office posted the records online after E&E News and other media outlets made public record requests for them during Pruitt's Senate confirmation process.